How are Greeks dealing with the refugee crisis? How do they perceive the problem, its scale and its causes? A diaNEOsis survey comes up with some answers. Since early 2015, nearly one million people have crossed over from the Turkish coast to the Greek islands, on their way to one of the prosperous countries of northern Europe. This mass crossing is considered the largest mass movement of people in recent history, and one of the most significant humanitarian crises that post-war Europe has faced. And it takes place here, on our country’s coast line. How are Greeks dealing with the refugee crisis? How do they perceive the problem, its scale and its causes? Download the full results of the study, with all figures and graphs, here (In Greek). To answer these questions, we designed a public opinion poll, which was carried out mid-January 2016 with telephone interviews on a sample size of 1,220. The study was published on February 28, 2016. Greek citizens in general underestimate the size and scale of refugee flows, and their knowledge of specific aspects of the problem seems limited. Greeks are disappointed by the response of the European Union, and are also dissatisfied with the Greek government’s approach to the problem. On the other hand, they strongly approve of the attitude of the people of the Greek islands and the work of NGOs, as well as of other state bodies, especially the Greek Coast Guard. Significant numbers of Greeks express strong feelings and opinions of sympathy and solidarity towards the refugees themselves, a conclusion confirmed through a series of different questions in the study. Additionally, do not want the country to close its borders in order to stem the refugee flow, and they also want Greece to remain in the Schengen Zone. Ideological identity is the most significant factor that differentiated responses. However, the general composition of the responses is clear – see conclusion #3 – with only a minority of citizens who self-identify with the ‘right’ responding differently to some of the questions. Below you can find a brief summary of each of the individual results. 1. Today, only one in five Greeks seems to have an accurate picture of the scale of the refugee problem. In 2015, according to official statistics, 856,723 refugees arrived on the Greek islands. We asked respondents to tell us how many refugees they believe have arrived in our country, and we posed the question in two different ways. For half of the respondents we left the question open, asking them to tell us the first number that came into their head. For the other half, we offered 8 alternative choices (from ‘up to 100,000’ to ‘more than 2 million’) and we asked them to choose. In both cases, the percentage of respondents who came remotely close was nearly the same: 21% said a number between 700,000 and 1 million in the first case, and 20% chose the ‘from 700,000 to 1 million’ option in the second case. Also in both cases, the percentage of respondents who underestimated the problem were relatively similar: 49% chose a number below 700,000 in the first case, and 58% in the second case. Two important differences appeared in the responses. 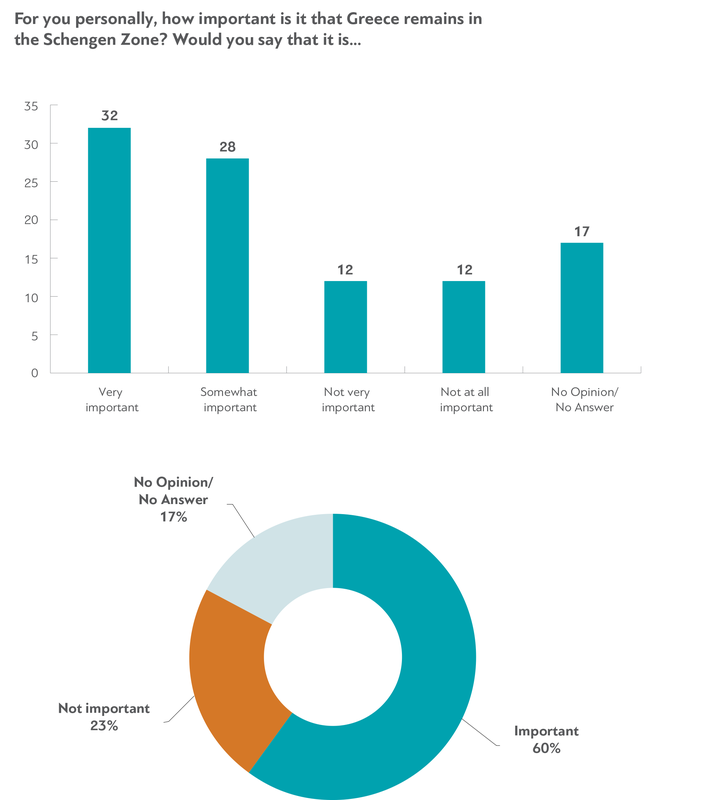 For the ‘open’ question, the percentage of respondents who answered ‘I don’t know’ reached 20%. In the question with alternative choices, only 6% did not express an opinion. This was expected. What we didn’t expect was the difference in percentage of respondents who gave a very low number, implying that the migration problem is quite small. Only 6% of citizens chose the ‘up to 100,000’ choice in the second phrasing of the question. To the first ‘open' question, however, the percentage of respondents who said a number lower than ‘100,000’ was much higher: 27%. It was the largest percentage that appeared anywhere in this particular question. Also, in the ‘open’ question, the percentage of citizens who responded with a number between 800,000 and 900,000 (in other words, the people who knew or guessed the correct number) was only 6%. It is interesting that a large portion of the public is unfamiliar with the various aspects of the refugee problem. 39% of respondents did not recognize the term ‘hotspot,’ while 30% were unable to identify what Frontex is. 4 in 10 Greeks believe that the refugee crisis is a ‘temporary’ problem. 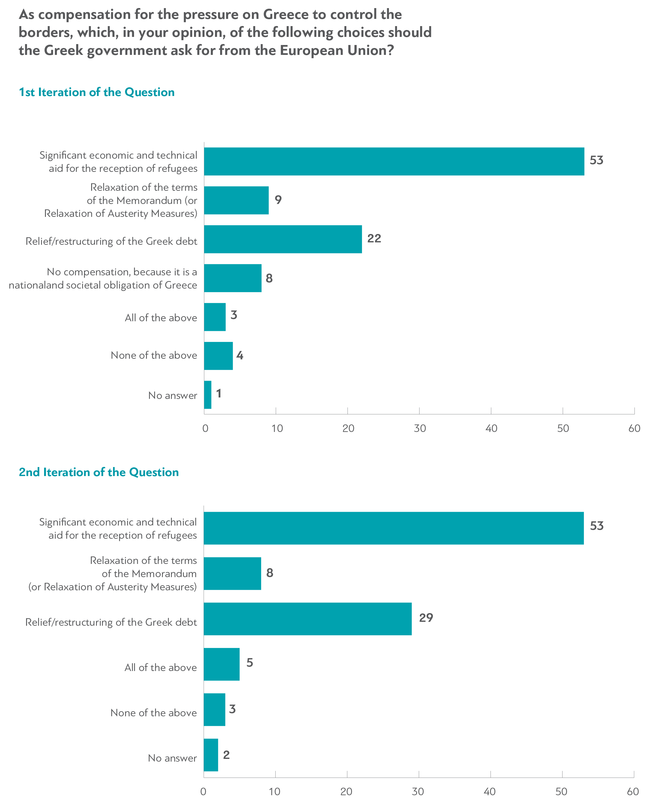 On the other hand, 83% of the respondents are familiar with the Schengen Treaty, and 60% consider Greece’s participation in it very important. We also posed the question of what compensation Greece should ask for from the Europeans in two different ways. We added an additional choice to the possible answers for half of the sample: That Greece should not ask for anything in exchange ‘because checks of the external borders of the European Union are a national and societal obligation.’ To the half that did not have that choice available, no one answered spontaneously in that vein. To the other half that did have the additional option, 8% chose it, while in the same subset the percentage of those who answered that Greece must ask for ‘Relief/restructuring of the Greek debt’ was around 7% lower. The extremely high opinion that Greek citizens have of the Aegean islanders (8.9), of the coast guard (8.44), and of the NGOs that work on receiving the refugees (7.5) is also noteworthy. 58% of respondents declared that they have actively demonstrated solidarity with the refugees. 3. One of the most important findings of the study is the intensely positive opinion that the respondents have of the refugees, evident in a series of questions. 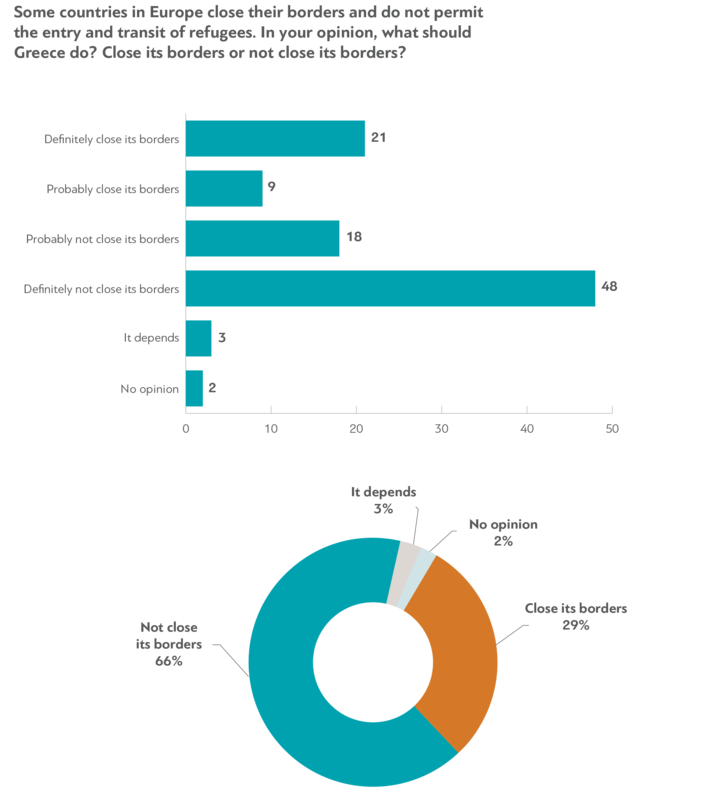 An impressive 58% of respondents declared that they have actively demonstrated solidarity with the refugees, offering food (39%), clothing (31%), and financial assistance (10%) and through volunteering (4%). The pollsters who carried out the survey projected the results on to the general population and arrived at the conclusion that, if the responses are honest, more than 5,000,000 Greeks have helped the refugees in some way. If this is true, it is perhaps one of the largest demonstrations of solidarity in the modern history of the Greek state. Other responses in the sample further underline this result. On the other hand, 53% of citizens want the country to accept less than 10,000 refugees (17% prefer to accept ‘none’) for resettlement, a number much lower than that which Greece is currently officially agreed to host. 60%, however, believe that the refugees who will stay should be living in rented apartments and not in special camps, while 81% believe that they should be given work permits. 4. 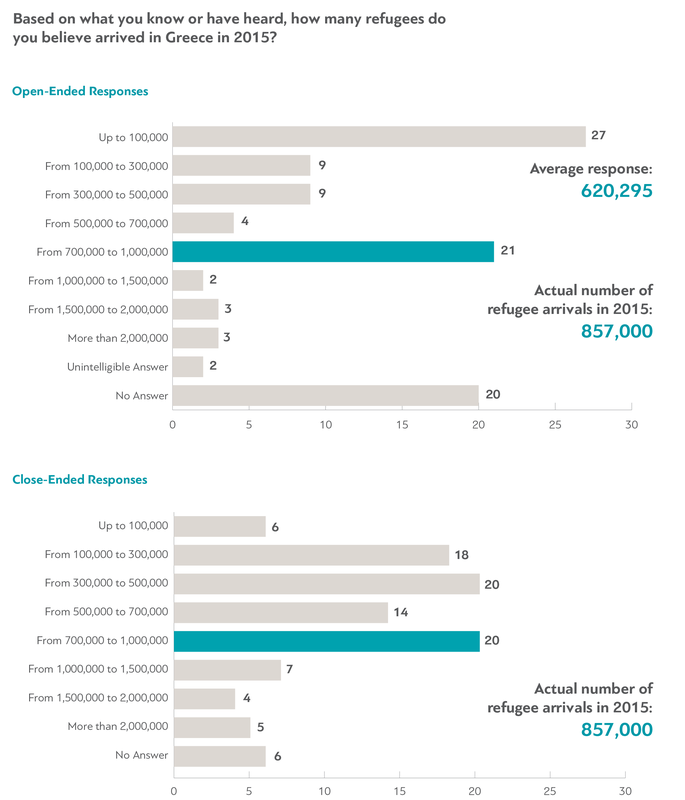 The responses to most of the questions were similar for all segments of the population, all ages and education levels, and regardless of whether the respondents had refugee origins themselves, with small variations. The most important variations appeared following a scale of ideological identification for almost all the questions. 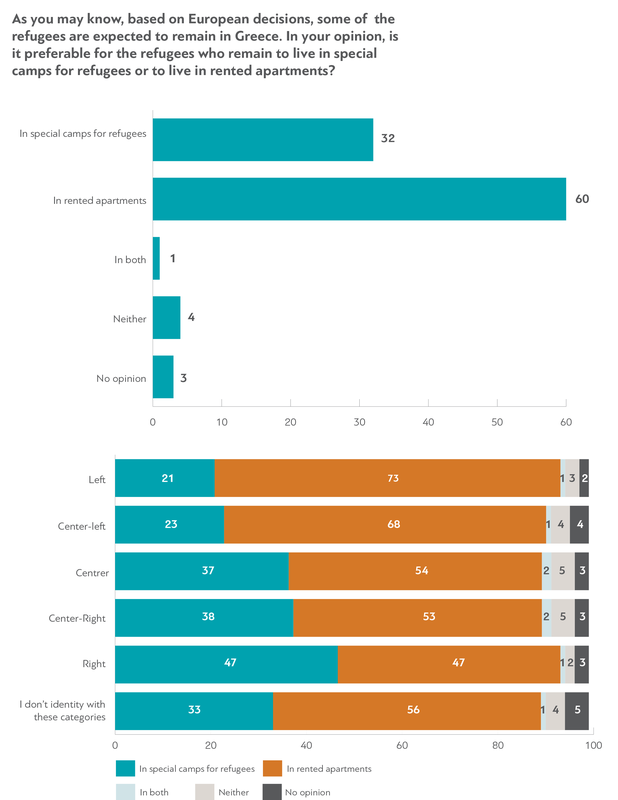 For example, 45% of those who identify as ‘right-wing’ want the borders to be closed and refugee flows to be stopped (compared to 30% of the general population and 10% of those identifying as ‘left-wing’). The ‘right’ are completely divided on where the refugees who stay in Greece should be settled, with half believing they should stay in special camps. The corresponding percentage of those who self-identify as ‘left’ is 21%. In addition, the ‘right’ are the only demographic group that expresses more negative (45%) than positive opinions of multi-culturalism. These variations, however, do not alter the general picture, which is, one could say, a picture of tolerance, solidarity and patience. The picture of a population that faces the problem with sympathy, disappointed with the approach of decision-makers (domestic and international) which represent it. The picture of a population still willing to help and contribute, although it does not have a very clear picture of the scale of the problem.